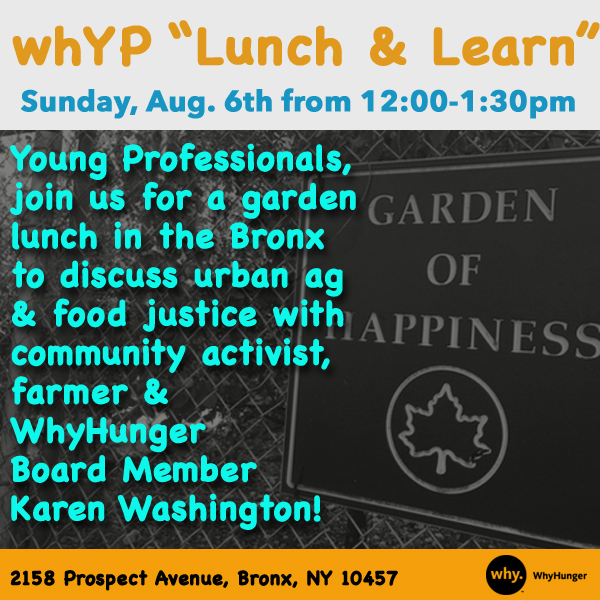 Join WhyHunger for lunch at the “Garden of Happiness” urban garden in the Bronx and learn as community activist, farmer and WhyHunger Board Member Karen Washington discusses the history of the garden and the importance of urban agriculture within the food justice movement. This garden was built by community members in 1988 on three former city-owned lots. Its name refers to the hopes of area residents that it be a haven from the city streets and a source of pride for the community that surrounds it. The garden is a focus of community activity and cultural exchange. Members have organized voter registration drives, census outreach programs, workshops on agriculture and soil testing, as well as food drives for the homeless. Deli sandwiches from a local Italian deli will be provided, along with drinks and fruit courtesy of Karen. Attendees will also have time to take a walk, check out the garden, and visit the chickens.